Tandy Color Computer, or known at that time as TRS-80 Color Computer is a home computer built on Motorola 6809E microprocessor. CoCo is a part of the TRS-80 series released by Tandy Corporation. Color Computer, built on the Motorola 6809 is radically different from the TRS-80 I/II/III/4 and 4p in the name “TRS-80” of course referred to the Z80 processor. Inside the company Tandy Color Computer was called the TRS-90 – “9” refers to the “6809”, but during the sale this name Tandy decided to keep the old name due to reasons. So, the Color Computer with the new processor still was called TRS-80. The project “Green Thumb” was launched in 1977 jointly by Tandy Corporation and Motorola Semiconductor, Inc. The main objective of the project was to create a cheap computer for home use. Initially, it was assumed the creation of a low-cost terminal for the Videotex system for people, working in the agricultural industry. This terminal could combine a conventional telephone line and a color television, allowing farmers to obtain the necessary almost in real time. Around the same time Motorola released a new MC6847 Video Display Generator chip. The emergence of this chip allowed to prepare a prototype system based on the MC6809 processor. The prototype was presented in 1978, however it contained too many chips, which was not practical for release, so the Motorola have solved this problem by combining the functions of a number of small chips in one MC6883 Synchronous Address Multiplexer. In the end of 1979, Motorola have released a new powerful microprocessor called MC6809. On the basis of these three chips – VDG, SAM and 6809 was created the terminal, called AgVision. Based on that, in July 31, 1980 Tandy has announced the TRS-80 Color Computer. At first glance it was identical to AgVision / Videotex terminals: the same design, keyboard and layout. 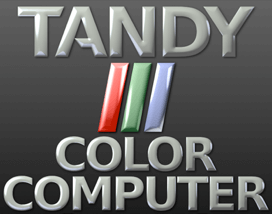 Tandy Color Computer roms games are here at your disposal. Download the emulator and enjoy the gameplay of the games from 80s and 90s.